The Oct. 25 local election campaign could cost at least $82 million for 132 political parties involved, according to experts’ estimates making it even more expensive than last fall’s parliamentary elections. But campaign financing in Ukraine has always lacked transparency, so only the politicians themselves know exactly how much money has been spent and where it comes from. More transparency is on the way. These are, hopefully, the last elections where parties can get away with shadow financing. Starting in July, the state budget will provide political forces with campaign financing and all expenses have to be transparently reported, according to a law approved on Oct. 8. Oleksiy Koshel, head of the nationwide non-government Committee of Voters of Ukraine, said that, according to official reports released by parties after the last elections, they spent $2.3 million altogether. However, Koshel said, monitoring groups counted that advertisement alone cost at least $27.3 million. “In general, we can say this campaign is slightly more expensive than the last one, but that’s natural, as now more candidates are involved,” he told the Kyiv Post. Kateryna Odarchenko, a political analyst at the SIC group company, told the Kyiv Post that the numbers reported by the political parties as their expenses probably amount to only 5 percent of the real amount. “This money ends up in the official bills, the rest is paid in alternative ways – in cash,” she said. According to Odarchenko, one can win a place in a local office of a small city by spending merely $2,000 for campaigning, while a nationwide operation can cost up to $50 million. “It’s based on my experience,” Odarchenko said. She is a consultant for one political party that she would not identify. Even the most basic campaign includes salaries of the staff and costs of printed campaign literature, Odarchenko said. Most of the parties, however, take it a step further, paying for outdoor, online and TV advertising, as well as “using the motivation methods” – or rather, gifts and even cash for the potential electorate. Bala said he knew only the approximate costs of the mayoral campaign in Kyiv, which is from $1.5 million up to $2 million per month. Joint research by Depo.ua and the Committee of Voters of Ukraine found that Ukrainian parties have paid a combined $82 million on their campaigns ahead of the Oct. 25 local elections. According to a joint investigation by Depo.ua and Committee of Voters of Ukraine, political parties registered for the upcoming elections spent altogether at least $82 million. Denys Rybachok, an expert with the Committee of Voters of Ukraine, explained that while working on the research, the authors analyzed information from open sources, such as official prices for advertisement, and spoke to local experts. The authors of the study estimated the average price of the direct and hidden advertisement, campaign staff salaries and the costs of bribing voters. For instance, they calculated that during the last two months of the campaign all the parties paid about $4.8 million for outdoor advertisement, buying some 75 percent out of 20,000 billboards all over the country. To promote themselves on TV, the parties spent up to $36.4 million in total. They also paid about $10.9 million for online advertisement and some $13.6 million for radio advertisement, according to the report. Campaigning in the press cost only some $910,000. However, the report did not include an analysis of financing sources. 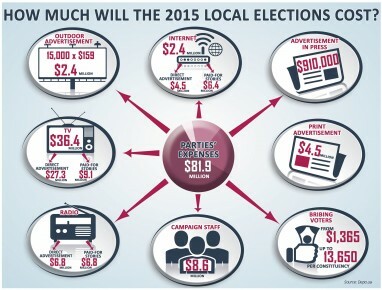 Most political parties contacted by the Kyiv Post said it’s difficult to count the cost of the entire campaign. Kyiv Mayor Vitali Klitschko spent more than $595,000 to be re-elected, paying all of it out of his own pocket, his press service said. But finding out the origin of the money comes is difficult. As an example, Odarchenko named the Radical Party, which she said might be using the money of Serhiy Lyovochkin, former chief of staff of the ousted President Viktor Yanukovych. According to Volodymyr Fesenko, head of Penta political think tank, Lyovochkin also sponsors the Opposition Bloc along with gas mogul Dmytro Firtash – accused of corruption in America, accusations he denies – and billionaire Rinat Akhmetov. Another billionaire, Ihor Kolomoisky, is commonly linked to UKROP party. The Kyiv Post was not able to get responses from all the political parties when this story went to print.